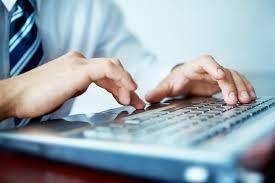 Faster typing is one kind of skill which you need to acquire in order to excel in your professional field. For any computer related job, faster typing is highly essential to increase your work efficiency. In order to improve the typing speed, first, you need to get familiarized with the keyboard keys. Position your left-hand index finger on ‘F’ key in the middle row or the home row and place the right-hand index finger at ‘J’ key in the same row. Now slowly place the other three fingers of your left hand on ‘A’, ‘S’, and ‘D’ and the two from you right hand on ‘K’ and ‘L’. Keep your finger slightly curved start hitting the keys slightly. Take the online typing lessons to know the finger placement for each key in order to feel them by touch. 99 percent of the individuals have the habit of correcting mistakes while typing which actually restricts their typing flow. Don’t do it. While you are typing something, maintain the long continuous flow without any disruption. Once you are done, come back to the paragraph to correct the mistakes. This also helps writers to give proofreading of their each written line which is essential for blog posts and article writing. While you are typing make sure your backbone is straight and your face is slightly tilted towards the computer screen. Your hands should be at right-angled position slight touching the keyboard front side with the lesser strain on your neck and shoulder. Don’t put your entire body weight down to our hands on the keyboard while typing. Also, while you type, look into the screen and not at the keyboard. If you type looking at the keyboard, you get cautious and typing speed gets slow down. 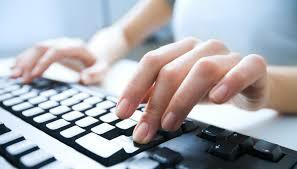 For this, you need to acquire your touch to type skills which you can do best with online typing lessons. Don’t be irresistible to follow the trends. Mechanical keyboards with fast response time are more in now as they help in faster typing. It's true but, switch to the mechanical version after you have excelled in the fast typing. It is advisable to start with the keyboards that have broader letter keys and number with a curved surface. This will help you understand better the position for each key and also give comfort to your fingers to increase your typing speed. Practice typing a lot to develop muscle memories for the different keys. Make a point to use all your fingers and both hands while typing and try to acquire the accuracy with minimum typing mistakes. You will notice a specific rhythm of your typing that which will further help you to type without seeing the keyboard directly staring into the screen. Your efficiency level will be based on how much time you dedicate correctly and regularly for typing.